yo can someone right a diss already?! ok guys im gettin the turtle beach xl1 head phones with mic for $40 and a white ipod touch for 178. i gotta pay by myself. im sellin my old ipod for 50 bux at skool. but a case im gettin costs 8 and comes with ifrogz earbuds. K-Baab wrote: ok guys im gettin the turtle beach xl1 head phones with mic for $40 and a white ipod touch for 178. i gotta pay by myself. im sellin my old ipod for 50 bux at skool. but a case im gettin costs 8 and comes with ifrogz earbuds. well if you come over my house you'll see it's barely bigger than hagrid's hut. Shuffle wrote: well if you come over my house you'll see it's barely bigger than hagrid's hut. lol check out this fail. 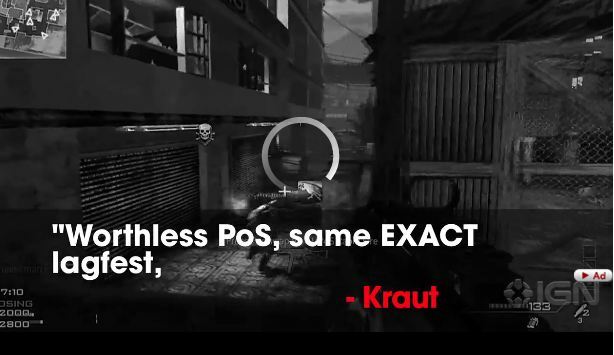 was watching a video making fun of CoDMW and it buffers....look at the lyrics on screen. right the the word LAGFEST came in the song, the video buffered. lol. ROFLMAO at "we got a baller"
sorta like that iHop guy who radiated swag that you guys keep talking bout. Maybe he quit that job and went for target. But apparently the ones they gave us were NOT 3G compatible even tho the guy told us they were, so they gave us the right ones at the same black friday pricing. Smooth.